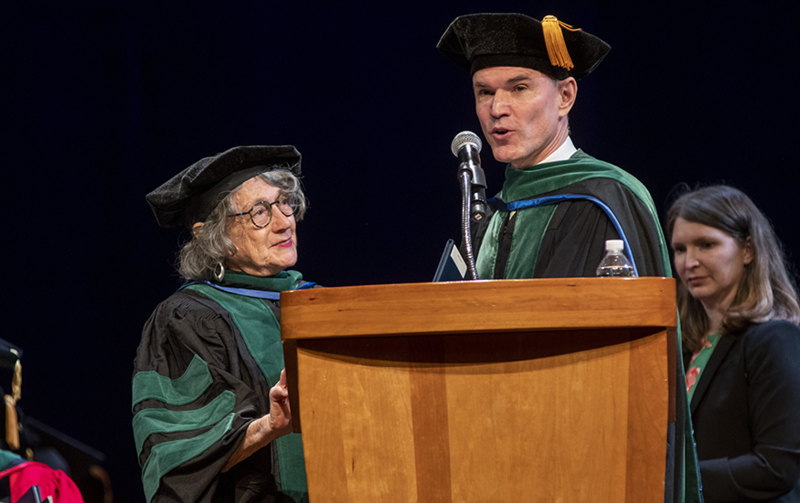 During the MD graduation ceremony on May 20, Raymond Lucas, MD, senior associate dean for faculty and health affairs at the George Washington University (GW) School of Medicine and Health Sciences (SMHS), presented 14 SMHS faculty members with Emeritus status. Stanley D. Beder, MD, Associate Professor Emeritus of Pediatrics: Beder joined the SMHS faculty in 1998 as an associate professor of pediatrics. During his career, Beder has provided leadership for the clinical electrophysiology programs at Rainbow Babies and Children’s Hospital, Children’s National Health System (Children’s National), and Georgetown University Medical Center. Ronald Bohn, PhD, Associate Professor Emeritus of Anatomy and Regenerative Biology: Bohn obtained his PhD in neuroanatomy in 1980 from Upstate Medical Center, State University of New York, in Syracuse. Following two years of post-doctoral work at the University of Maryland School of Medicine, Bohn was appointed to the faculty at SMHS. Julia B. Frank, MD, Professor Emeritus of Psychiatry and Behavioral Sciences: Frank joined the SMHS faculty as an assistant professor of psychiatry and behavioral sciences in 1993. She was recruited to GW as a program director for the psychiatry residency program. She retired from the GW Medical Faculty Associates (MFA) in 2015 after 22 years of service. Howard S. Goldstein, MD ’71, Clinical Professor Emeritus of Medicine: Goldstein received his medical degree from GW in 1971 and returned in 1976 to complete a cardiology fellowship. He served as a preceptor for SMHS students during his time as attending physician at Holy Cross Hospital in Montgomery County, Maryland, between 1977 and 1996. Goldstein was appointed to the clinical faculty at SMHS as an assistant professor of medicine in 1979. Lawrence Kwok Leung Jung, MD, Professor Emeritus of Pediatrics: Jung joined the SMHS faculty in 2010 as a professor of pediatrics after joining Children’s National as a division chief of rheumatology in 2008. He is nationally recognized for his clinical expertise in pediatric rheumatology. Jung had a role in establishing the pediatric rheumatology clinical fellowship program in 2013. Prudence P. Kline, MD, RESD ’81, Clinical Professor Emeritus of Medicine: Kline completed her residency training in internal medicine at GW. She served as a community-based emergency room physician for a year before joining the SMHS faculty in 1982 and she practiced emergency medicine at GW Hospital until 1986. She was appointed to the clinical faculty as clinical associate professor of medicine. Ajit Kumar, MD, PhD, Professor Emeritus of Biochemistry and Molecular Medicine: Kumar joined the SMHS faculty in 1979 as an associate professor and the King Fahd Professor in the Department of Biochemistry. He also held secondary appointments in the departments of microbiology, immunology, and tropical medicine and genetics. John W. Larsen Jr., MD, Professor Emeritus of Obstetrics and Gynecology: Larsen joined the GW faculty as an assistant professor of obstetrics and gynecology in 1975. He served as associate, acting, and interim chair of the Department of Obstetrics and Gynecology before being named chair in 2004. Larsen also served as medical director of the MFA and as a trustee of GW Hospital. He retired in 2017. John A. Lowe, MD, Clinical Professor Emeritus of Pediatrics: Lowe was appointed to the SMHS faculty as a clinical professor of pediatrics. In 1974, Lowe went into private practice and served as preceptor for GW medical students and residents. He returned to Children’s National in 2000 and was actively engaged in teaching MD students, physician assistant students, and pediatric residents. Robert J. Neviaser, MD, Professor Emeritus of Orthopaedic Surgery: Neviaser joined the GW faculty as an associate professor in the Department of Orthopaedic Surgery. He was promoted to professor in 1976 and was made chair of the department in 1987 and served until 2015. Neviaser retired from the MFA in 2017. Stuart M. Stotsky, MD, Clinical Professor Emeritus of Psychiatry and Behavioral Sciences: Stotsky joined the Department of Psychiatry and Behavioral Sciences at SMHS in 1977 as an assistant professor. Between 1977 and 1992, Stotsky served as director of the department’s Division of Ambulatory Care and director of outpatient services. In 1999, he joined the GW Center for Health Services Research and Policy as a senior research scientist. Samuel V. Spagnolo, MD, Professor Emeritus of Medicine: Spagnolo joined the faculty at SMHS and the clinical staff at the Washington, D.C., Veterans Affairs Medical Center in 1972. He has served on numerous departmental and medical center committees, including chairing the Task Force on AIDS from 1987–88. Spagnolo was in charge of President Ronald Reagan’s post-surgical care following the 1981 assassination attempt. Jon C. White, MD, RESD ’87, Professor Emeritus of Surgery: White completed residency training in surgery at GW and served on the clinical staff at the MFA for a year before pursuing clinical transplantation training at Massachusetts General Hospital/Harvard Medical School. He was appointed to the SMHS faculty as an instructor of surgery in 1987, returned to the MFA in 1989, and then joined the medical staff at the Washington, D.C., Veterans Affairs Medical Center in 1991. Muriel D. Wolf, MD, Associate Professor Emeritus of Pediatrics: Wolf joined the SMHS faculty in 1974 as an associate professor of pediatrics after completing a fellowship in pediatric cardiology at Johns Hopkins University and joining the clinical staff at Children’s National in 1966. She retired from Children’s National in 2016.